Today, I'm very excited to present THE REVEAL of the Princess' Bedroom! This view of the other side of the room shows the Princess' dresser which we painted blue, as well as the window seat which we reupholstered from pink plaid to green polka dots. You can read more about that here. Here's another view of the window seat. 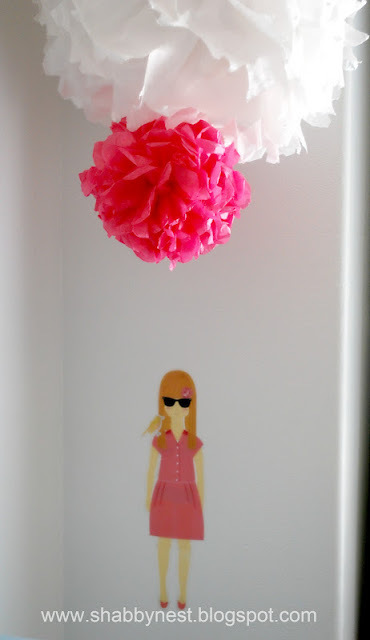 I added the pom-pom fringe to some store-bought curtains to give them a more custom feel. I also made all of the pillows. 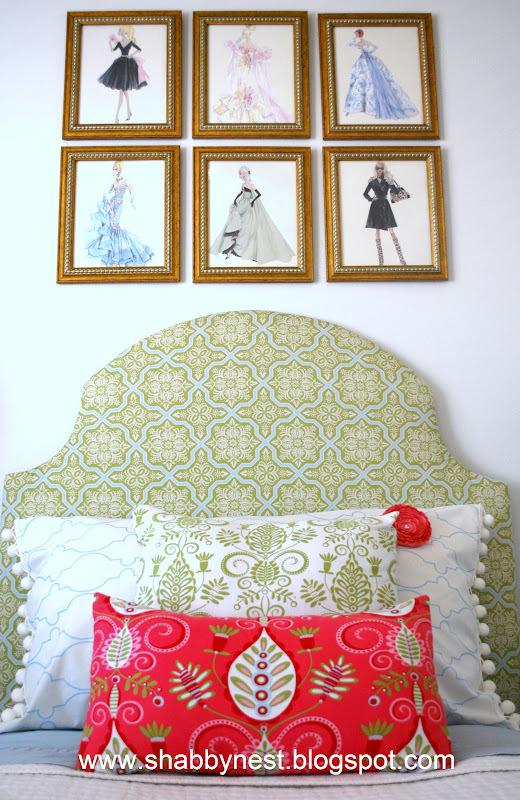 The green pattern pillow was used in the Princess' bedroom in our previous home. I made the blue and white pillow with fabric that I designed on Spoonflower.com. You can read more about that here. I also created the linen pillow using a drawing that I did of some ballerinas. Watch for a tutorial on how you can make one too...coming soon. 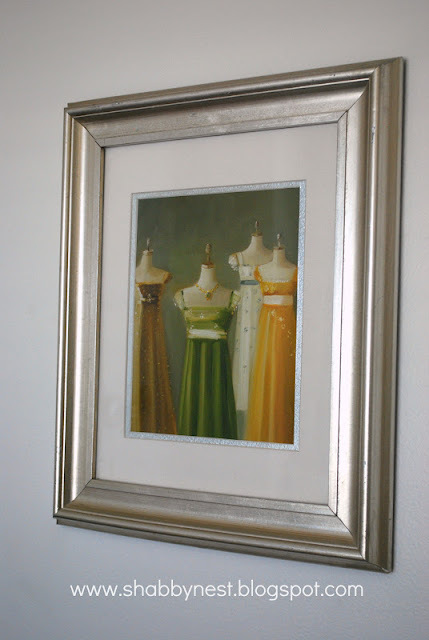 I don't know if you've noticed yet, but this room has a bit of a fashion theme going on...(I don't like over-the-top themes, but a subtle theme is always fun) and this print called Jane Austen Dresses is from this vendor on Etsy and was a perfect addition. Here's a little detail from the window seat. And here's another view of the bed. The art was created using a Barbie fashion calendar. You can read more about how I created it here. The quilt is the pick-stitched quilt by Pottery Barn. Here's a close-up of the pillows. 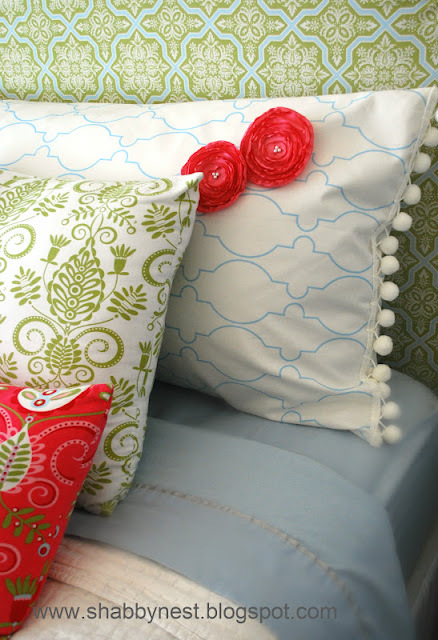 Again, the blue and white pillow was created using my Spoonflower fabric, and I embellished it with some "melted" flower brooches that I created. You can read about that here. 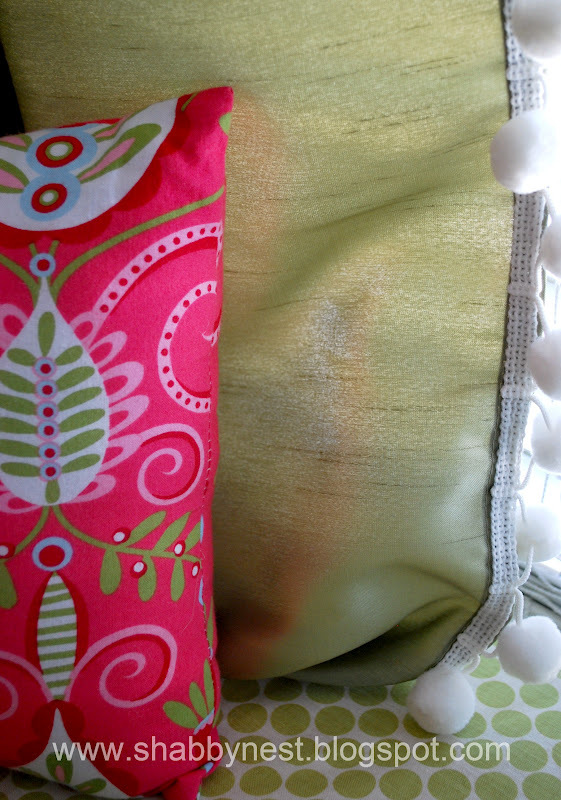 I also added a bit of pom-pom fringe to this pillow to tie it in with the curtains. Here is a detail of the sconces. 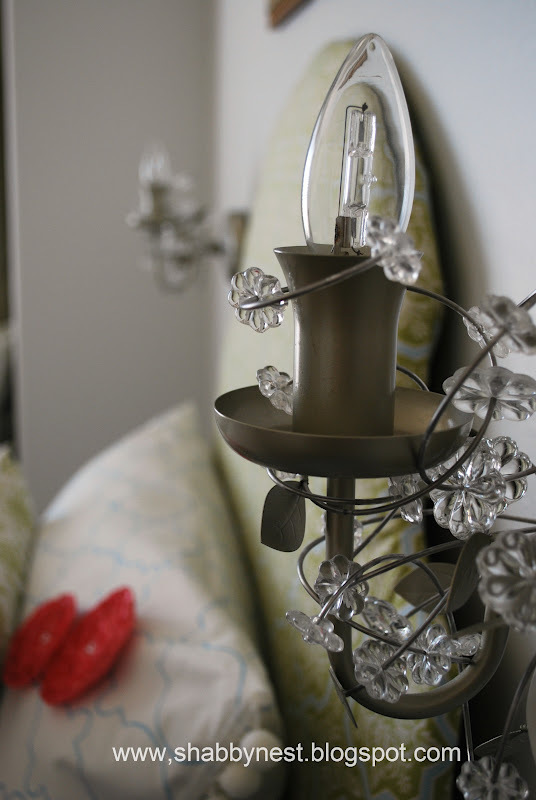 Since the room is on the small side, I felt that sconces would be a better choice than lamps. These cuties are from IKEA. So cute. Love the headboard and window seat. I'm sure she loves it. Gorgeous room! What a lucky princess! 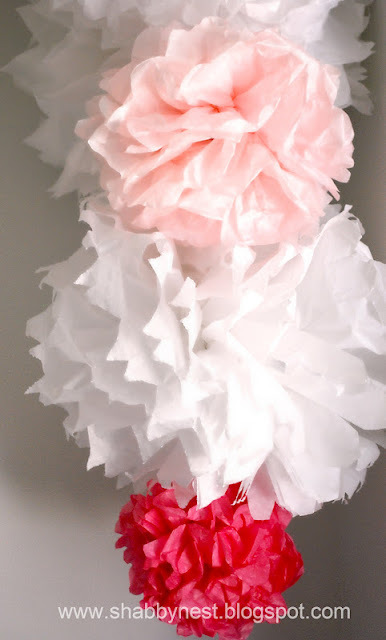 I'm putting together a vaguely 'dress' themed room for my daughter right now. 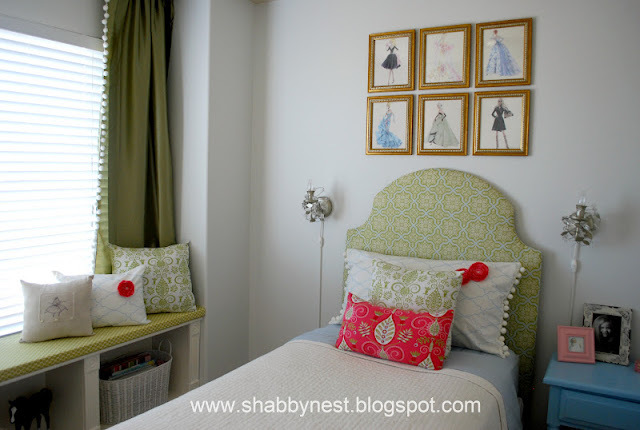 :) I love the fabric you designed, and the colors in the room are beautiful! looks amazing! I LOVE it!! Love the details. Looks fabulous Wendy! 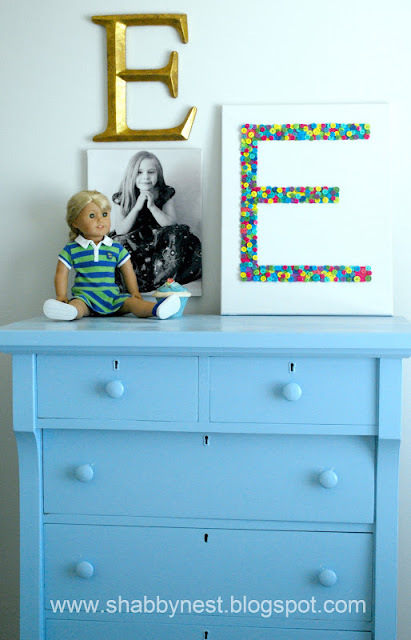 With two boys here, I never got to do a "girlie room" but love seeing all of the adorable afters in blogland. Wow, the room looks great! it looks so grown up and beautiful! love the dresser and the colors! 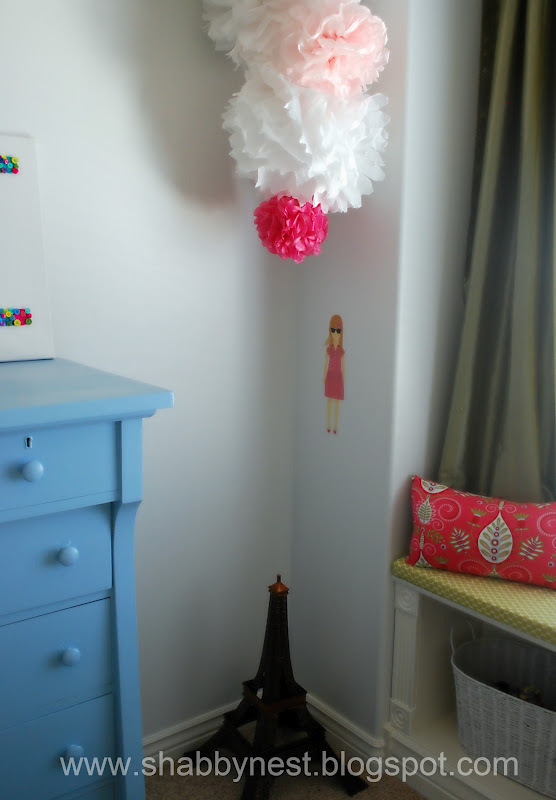 i just painted my daughter's room a white, too, and i love how colors pop against it. i bet your daughter is thrilled! It's so darn pretty! I wish this was my room it's so cute. What a beautiful bedroom! No wonder your daughter loves it. It's so pretty! The green you used is gorgeous! I bet she loves it! Isn't this just the prettiest room ever! Bet your daughter loves it! I really love the color palette you chose too and the art work above the bed is fab! The room looks great, all of it, but I think my favorite element is the ball fringe! Crazy as that sounds (and by no means diminishing the great design and happy green), I just have a thing for ball fringe, always have. It evokes memories I guess. Surely your daughter will make great memories in this pretty room. Looks amazing but what about the headboard? Is it a d-i-y project or purchased? Cause it looks fabulous! Perfect, Perfect, Perfect in every way! Gorgeous room Wendy! 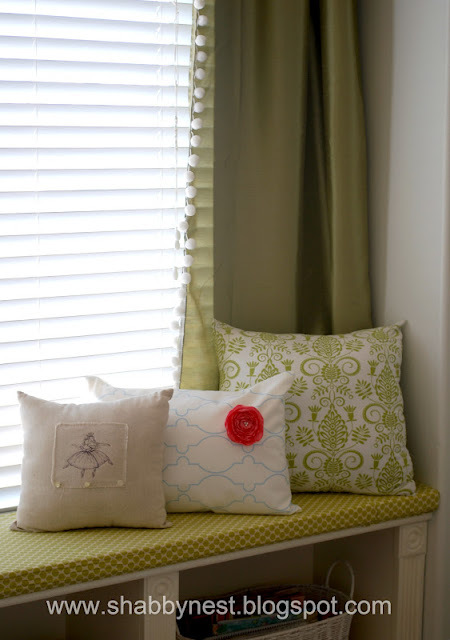 I love the headboard and the window seat. I'm sure she's lovin' it! What a beautiful room! Love what you have done...all the little details add such great character. I love it! I'm another one who loves the fabric choices - I'm working on my own daughters room at the moment, so you've given me a few ideas! Thanks! I don't know if you are linking this to any parties, but I would love for you to bring this to mine! Impressive work - wow. I am in the midst of a transformation of my daughter's bedroom as we speak and I am afraid it's gonna be awhile. So exciting to be done! Great job! What a lovely room you have created! Great job! I love those prints above the bed! They are awesome! Great room make-over! Love the headboard and the wall frames above it! What a fun big girl room! 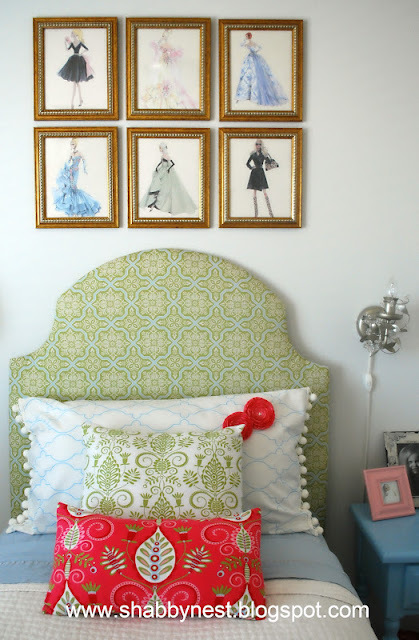 I love the photos above the bed, so vintage and fun and girly!! Great job! So grown up but not too much so. Love it. 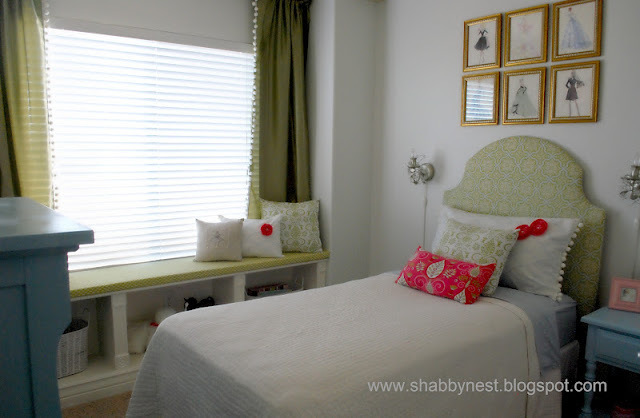 Love the pillows and those cute sconces. I think I need to drive 3 hours to IKEA to get some. How beautiful! I adore your pillow touches and these are sooo sweet! LOVE the splashes of colour! How pretty! The decor of this room will grow with your daughter for years to come. I love it! How lovely! And those prints over the bed are very cute too! The pompoms and the headboard are doing me in, so amazing! I'm heading over to see how you made that button art, I could use something like that for my princess. I can't tell you how thrilled I am to read/see your post. 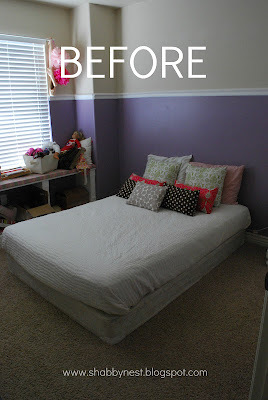 Your daughter's bedroom is PRECIOUS! I am teaching a decorating class to high school girls and their aim is to re-do their bedrooms. This post will be definitely shared with them for inspiration and ideas!! Sweet Dreams to the Princess! Superrrb... One lucky girl your daughter is!! this is a great room! i love how it turned out, this is great for young girls who love fashion. where did you get the wall lamp/chandeliers?